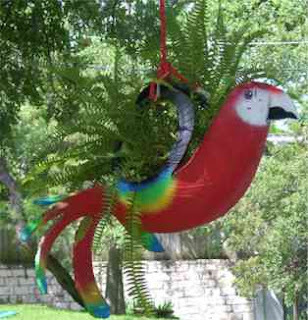 This colorful parrot planter is made from recycled tires.If you don't care for the red parrot, you can ask for a blue parrot or a blue & gold macaw or a black toucan. It's up to you! Weighs about 15 lbs., and in my humble opinion is really quite a clever idea! Don't let the picture fool you. 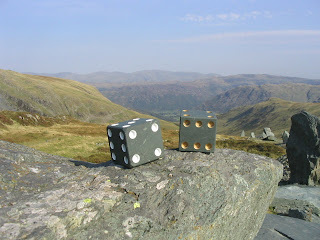 These are not giant dice, they're only 2 inches square in size. Nonetheless, they're quite nice. Made from polished slate, the paperweights are available with gold, silver, or white dots. I just love this crazy, mod creature, er stool! 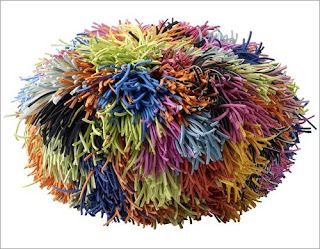 It's bright, colorful, firm, and it's environmentally friendly because it's made from EVA strips from recycled flip flops. From Brazilian artist Karin Wittmann Wilsmann. Measures 14 inches high, 24 inches in diameter. 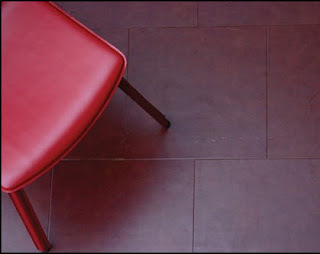 If you like the classic look of leather, then check out this beautiful flooring made from 65% recycled leather, 20% natural rubber, and Acacia tree bark, a natural binding agent. Resilient and durable, these tiles develop a wonderful patina over time. Can be used towards LEED certification. 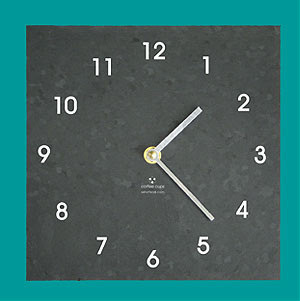 Recycled coffee cups from vending machines are the raw material for this classic clock, which is part of the Recycled Range collection. The coffee cups are recycled as part of the UK Save-A-Cup program. Wall mounted, indoor use only. 200 mm x 200 mm. These charming wood labels dubbed "TimberTags" double as place cards, favors, or gift tags at weddings, dinner parties, birthday parties, or informal gatherings. Made by UK artist Charlie Artingstoll from recycled wood or from certified renewable resources. I never thought I would use the words "chic" and "circuit board" in the same sentence, but I think it applies here. 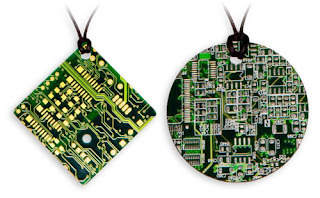 In fact, these circuit board pendant necklaces almost have an Art Deco look about them with their geometric patterns and machine age look. This stunningly beautiful garden furniture is made from reclaimed ingots of industrial aluminum to be exact. Choose from loungers, chairs, and tables. Detail pictured here is from one of the tables in the collection. 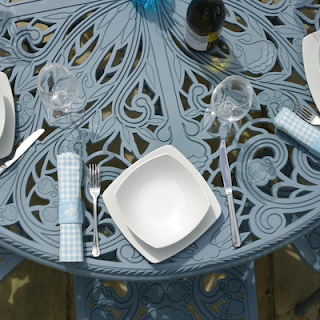 Rust proof, rot proof, weather proof, and tastefully designed in the traditional English garden style. What more could you ask for? Fire pits are one of the hottest (pun intended!) trends in outdoor living these days, and here's one made from recycled copper. Great for chilly fall evenings or summer fun. Legs and grill are wrought iron. Burns wood or charcoal. 24 in, 30 in, and 36 in diameters available. Safety screen sold separately. I recently featured these lovely plant labels at The Daily Dirt, my environmentally friendly gardening newsletter & blog, but felt they'd fit right in here as well. A great gift for gardeners, the plant labels are made by a London artist. 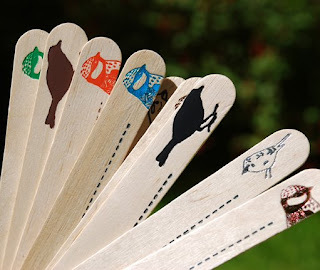 The designs are hand-foiled on pine "popsicle sticks". Package of 10, 15 cm. long. Now this is what I call transferable eco-chic! 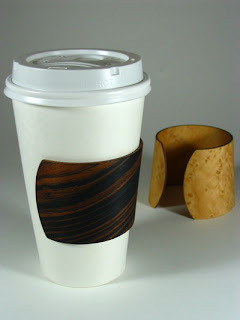 Based on the concept of the cuff bracelet, these cuffs, which are made from reclaimed wood veneers, double as coffee cup jackets. From Vancouver-based design firm Contexture via dailyartmuse.com. 2.25 in. wide in ebony or bird's eye maple. 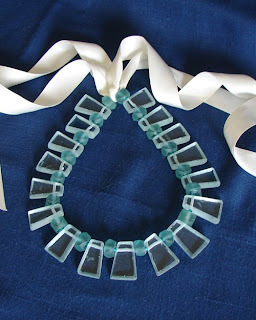 This lovely deco-inspired necklace is made from recycled glass (including the rondelle beads) and finished with a satin ribbon bow clasp or traditional clasp (your choice). 20 in. long. 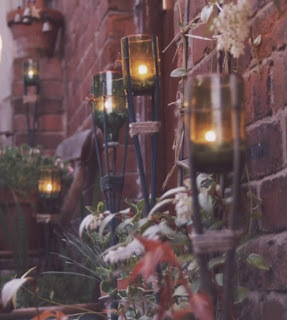 A modern day twist on gas lights, these beer bottle lanterns are genius! Artisans cut the bottle in half and use both the top and the bottom to make the candle holder. Terrfic for intimate garden settings. Each beer bottle lantern measures approximately 62cm high and comes with a Citronella t-lite and gravel. Made from recycled glass, these environmentally friendly tiles are manufactured by the Spanish company Vidrepur. The mosaic pattern shown here is "Joy". 1 in. x 1 in. 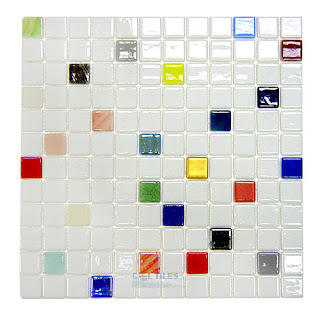 tiles on 12.5 in. square mesh backing. Indoor, outdoor, and swimming pool use. They call it a tote, but I think it looks more like a cute handbag. 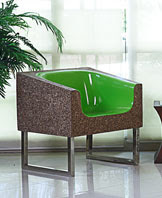 Either way, it's an eco-friendly alternative made from seagrass, a sustainable material. 8 mod colors, with wood handle and magnetic snap closure. Sturdy, durable, and gorgeous! These placements are made from woven water hyacinth, that pesky, invasive plant that's overtaken waterways and choked out native plants. Ok, rant over! 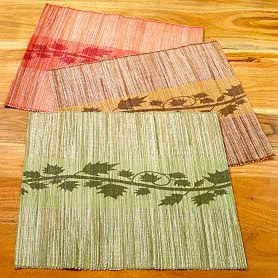 Set of 4, green , brown, or red with screen print design. Each one measures 20 in. long x 13.5 in. wide. Made in Indonesia. 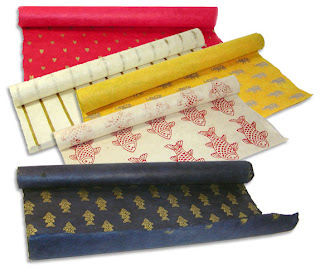 This stunningly beautiful wrapping paper is made from the bark of the lokta, an evergreen shrub growing in the mountains of Nepal. The bark is harvested, soaked, cleaned, and dried before it is made into paper. 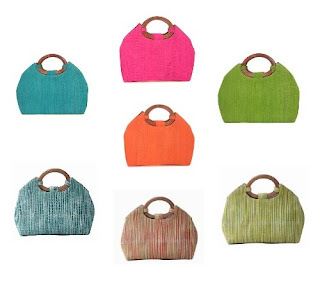 A fair-trade product made from sustainable materials. 30 in. x 40 in. sheets. Folded or rolled. This museum bench is like no other but you'd never guess it just by looking at it. What makes this museum style bench--perfect for you post-modernist garden, entrance hall, or interior courtyard--so unique is that it's made from Tree of Heaven. Tree of Heaven is anything but. In the US it's an invasive tree that has overtaken urban neighborhoods. You may have heard it referred to as "ghetto palm" or something similar. 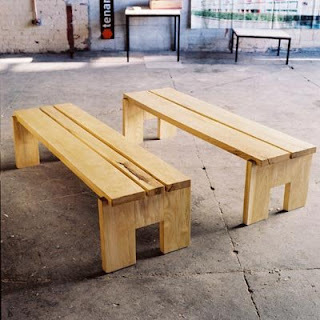 Mitch Cope, a Detroit-based artist, harvests the wood from these trees from vacant lots around Detroit and uses it to make decorative or functional objects like these museum style benches. Solar panels or flairs in the shape of flowers. Love it...or not? What's behind these flower petals of solar power, besides creating energy from the sun, is aesthetics. 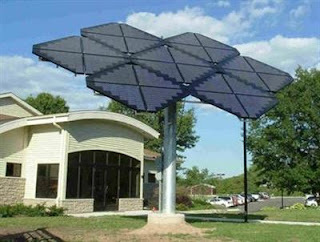 Instead of run of the mill solar panels you can have solar panel sculpture. Why not? Lake Michigan Wind and Sun Ltd.
Made with recycled glass beads and raffia by Kukwa Arthur who works with a women's cooperative in Ghana. 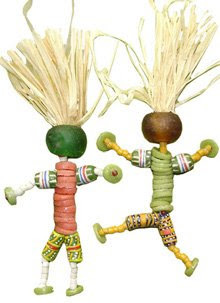 Raffia is thought to bring about good fortune. Each spirit is unique, about 6 inches high. Cool, colorful, and eco-friendly. Just what we like! 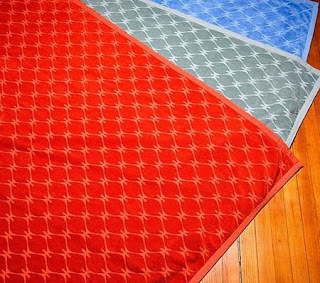 Made from 50% organic cotton and 50% bamboo fibers, the St. Moritz Blanket comes in three colors; Persimmon, Aegean & Sky. Perfect for your eco-mod apartment or house. From Yumi & Laurie, a family run business dedicated to ethical and organic design. Made in Turkey. Measures 6.6 feet x 4.9 feet. It may not be beach season where I live, but there are plenty of places around the world where it is. 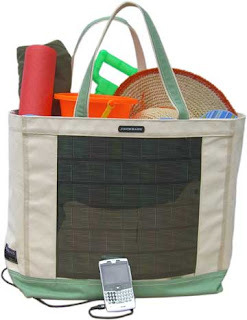 This ordinary beach tote is not so ordinary because it's designed with a thin film solar power panel insert. Perfect for charging your mobile phone, iPod, GPS, or camera--anytime, anywhere! Measures 19" wide x 15" high x 11" deep; 48 x 38 x 28cm. Nature's Cast products are made from the forest waste such as bark, leaves, and twigs that litter the forest floor in Compostela, Province of Cebu, The Philippines. The forest debris is shredded by machine, and using a water based binder, is shaped into furniture like the green cube chair shown here, decorative furnishings like vases, and interior decor including wall plaques, all of which are designed by local artists.